Manalapan dentist, Dr. James Courey helps people recovering from eating disorders. 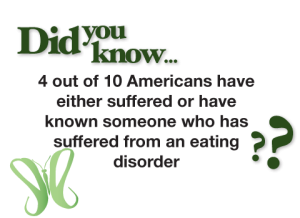 The National Eating Disorders Association (NEDA) estimates that in the United States, nearly 10 million women and 1 million men are affected by anorexia or bulimia. Millions more suffer from binge-eating disorders. Eating disorders are illnesses characterized by preoccupations with food and weight and caused by physical, emotional and social issues. People who have anorexia severely limit the amount of food they eat and can become dangerously thin. People with bulimia eat compulsively (binge) and then rid themselves of the food (purge) by vomiting, exercising too much or using medicines such as laxatives. People with binge-eating disorders will regularly eat large amounts of food within a couple of hours or less (a binge) but do not purge their system afterwards. With so many men and women suffering from eating disorders, more dentists are becoming the first line of defense when it comes to recognizing these problems in patients. Although parents may not know that their children have an eating disorder, they often ensure that their children have regular dental appointments. In such cases, a dentist may spot the warning signs of an eating disorder and be able to point parents in the right direction to get help. Dentists who detect patients with eating disorders may recommend therapists to help treat the disorder and may also teach patients how to minimize the effects of purging. For example, after vomiting, patients should immediately rinse their mouth with club soda or use a sugar-free mouth rinse to neutralize the stomach acid in their mouth. If neither of these is available, patients should swish water around their mouth and brush with a soft toothbrush and fluoride toothpaste. Sometimes, eating disorders are not discovered until it is too late and significant damage has been done to the body as well as the teeth. According to NEDA, early detection of the disease may ensure a successful recovery period for the body and teeth. Once recovered from eating disorder, regaining a healthy mouth and smile is an important step in looking healthy again. To schedule a consultation for a full mouth makeover, please call us today.